The Extremely popular Coupe Style yachts was perfected by Cruisers Yachts with this beautifully maintained 390 Cruisers Coupe. One of the best layouts in an express boat, this boat features a one level salon with an aft sofa allowing an open conversational environment. Original Owner who put an easy 960 hrs over a 10 yr period on the Twin Volvo Diesel Engine-Model IPS500@ 370 HP. Separate throttle & clutch controls w/ Joystick. Mechanically and Cosmetically well maintained and serviced. The cockpit features a full glass windshield all the way to the hard top with a walk-thru windshield feature. Full Electronics, “BAIL OUT” is ready to cruise in comfort and style with family and friends. Don’t miss this unique Opportunity to own a Cruisers Coupe at a Reasonable price. United Yacht Sales Emerald Coast would love to guide you through a personal showing of this 39' Cruisers Yachts 390 Coupe 2008. 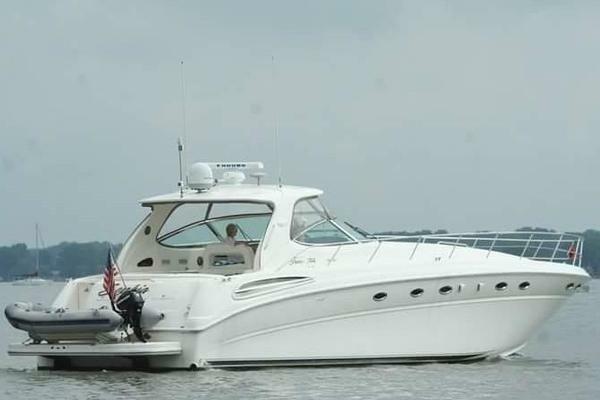 This yacht for sale is located in New Orleans, Louisiana and priced at $199,900. For a showing please contact us by filling out the form on this page and we will get back to you shortly! A roomy open plan salon is comfortable and tastefully decorated. The 390 Sports Coupe Lives Up To Her Name! Powered By Twin Volvo Penta D6 IPS Diesel @ 370HP each including the innovative System with Joystick, Full Glass Enclosure, Walk-Thru Windshield, Foredeck Chaise Lounge and a Sliding Sunroof. The 390 Cruisers Sport Couple has the rich cherry wood interior, large head with stall shower and spacious room for entertaining and relaxing with family and friends. The cockpit is protected from the elements, and has a unique layout providing several entertaining and lounging options. Hot water system - 10.5 gals.